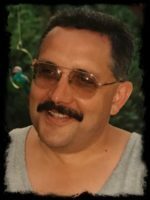 Mike passed away Tuesday, January 15, 2019 at his home in Otsego. He was born June 5, 1959 in Plainwell the son of Robert and Mary Ellen (Sornbury) Fergusson-Woodstock. Mike was an Otsego High School graduate. He proudly served his country in the U.S. Air Force and was stationed at bases in Marquette; Phoenix, Arizona; Ramstein, Germany and Champagne, Illinois. Mike had worked in security for department stores in California. After returning to Michigan he had been a manager at Coleman Rent to Own and had also sold advertising for businesses throughout Southwest Michigan. In his spare time he enjoyed watching the deer in his backyard, playing the lottery, collecting old coins and spending time with his friends and neighbors. Mike was a member of the Otsego VFW Post #3030. He had married Denise Midose in Otsego. Surviving are his children, Heather Fergusson-Lincoln and Michael Fergusson Jr.; grandchildren, Olivia and Colton; his mother; sister, Laura Riddell; his ex-wife, Denise Lincoln; nieces, Wendy White, Krista White and Tara Sweet and nephew, Ryan Sweet. He was preceded in death by his father and siblings, Karen and Steve. Burial of ashes will take place at 11:00 A.M., Monday, February 11, 2019 at Mountain Home Cemetery in Otsego. A reception in honor of Mike will follow at Baraga Manor in the Community Room. Contributions in memory of Mike may be made to Otsego VFW Post #3030 or to Baraga Manor Resident Council. Offer Condolence for the family of Michael J. Fergusson Sr.
Posted by Winkel Funeral Home on January 17, 2019 7 Comments on Michael J. Fergusson Sr.
Our thoughts and prayers are with Maryellen and family during this difficult time. So sorry to hear of Mikes passing. Thoughts and prayers with Maryellen and his family. I didn’t know Michael’s family, but I did know him. He was a great guy, straight shooter, friendly. I haven’t seen him in a while and missed him already. It’s very sad to know I’ll never see him again. So sorry to hear of Mikes passing. Our thoughts and prayers are with you. I will miss Michael so much, we always had a lot of fun! A everyone here will also miss him! My Granddaughter Mariah you-to cut his hair, she was sad , when I told her about Mike, to!